The Tri for the Cure brings you a whole new racing experience, with smaller waves grouped by ability. 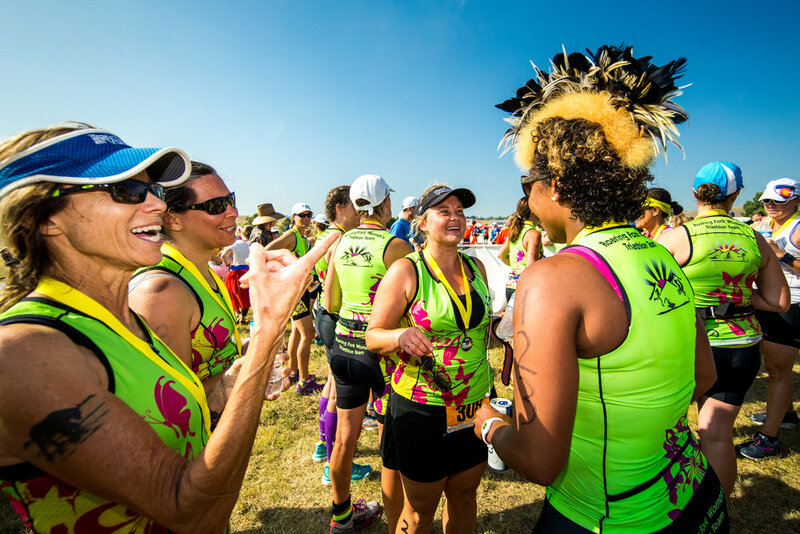 Set your race-day goals and choose your ability level when registering. Racing with your ability level means a smoother swim start, easier pacing, and more open transition areas. Athletes must be at least 16 years old on July 31, 2019 to participate. Racing with your friends, regardless of your age or ability, is your goal. Since your team's ability level and ages will vary, you will be timed, but you will not be eligible for ability or age group awards. The Buddy Wave starts after the ability level waves. This is your first triathlon, or not, but you still consider yourself a beginner, and you prefer additional support on race day. Within the Beginner Wave, you will be grouped with other beginners in your same age group - ages 19 and under, 20 to 24, 25 to 29, 30 to 34, 35 to 39, 40 to 44, 45 to 49, 50 to 54, 55 to 59, 60 to 64, 65 to 69, 70 & above. You are more than a beginner but not quite a "competitive" racer. You consider yourself an athlete and your race time is important to you. Within the Intermediate Wave, you will be grouped with other intermediate-level racers in your same age group - ages 19 and under, 20 to 24, 25 to 29, 30 to 34, 35 to 39, 40 to 44, 45 to 49, 50 to 54, 55 to 59, 60 to 64, 65 to 69, 70 & above. Within the Competitive Wave, you will be grouped with other competitive-level racers in your same age group - ages 19 and under, 20 to 24, 25 to 29, 30 to 34, 35 to 39, 40 to 44, 45 to 49, 50 to 54, 55 to 59, 60 to 64, 65 to 69, 70 & above. You have finished top ten overall of the Tri or any other triathlon in the last 24 months and/or feel comfortable competing with athletes of this athletic ability. Within the Elite Wave, you will be grouped with other elite racers in your same age group - ages 19 and under, 20 to 24, 25 to 29, 30 to 34, 35 to 39, 40 to 44, 45 to 49, 50 to 54, 55 to 59, 60 to 64, 65 to 69, 70 & above. If you do not want to participate in all three events, sign up with a relay team. Your team will decide which person will participate in each event. Only one team member may participate in each event – that is, there cannot be two swimmers in the water from the same team. However a two-person team will have one member competing in two events. Learn more about relay teams.